Twelve Sri Lankan fishermen were on Friday arrested by the Indian Coast Guard for allegedly crossing the International Maritime Boundary Line and fishing in Indian waters. 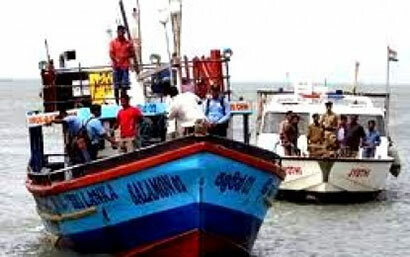 Coast Guard ship ICGS Abheek spotted two Sri Lankan boats some 120 nautical miles east of Chennai and arrested the 12 fishermen aboard, a statement said. The boats, which had 750 kg of fish catch, were seized and the fishermen booked under Maritime Zones of India Act, 1981, it said, adding that they would be handed over to Tamil Nadu Police soon.